This EHX demo of the Electro-Harmonix Worm by Peter Stroud… is pretty damn good. I forgot about the flavor that this guy has. He really explores a variety of different sounds that can come out of this unit. Basically, this pedal (in the newer style XO enclosure now) is your swiss army knife of modulation in a box. You can perform auto-wah (new-modulated), phaser, vibrato and tremolo effects. The unit is completely analog and as you can hear, can create some tasty modulation flavors! 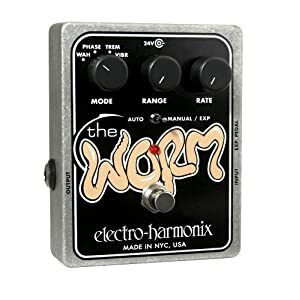 For what this unit is capable of, the Electro-Harmonix Worm is available at an affordable price point of $105 at Amazon! The Worm also ships with Free Super Saver shipping. If you have personal experience with this pedal, please comment below and let me know what you think of it! I wish this pedal had been released before I bought so many pedals! For example, the modulated wah sounds very much like the BOSS AW-2. The Worm is amazing value for the money.